Adding another code on top of the UPC means you will have to buy more manuals—costing you up to $500. That’s money out of your pocket and into the pockets of the International Code Council. 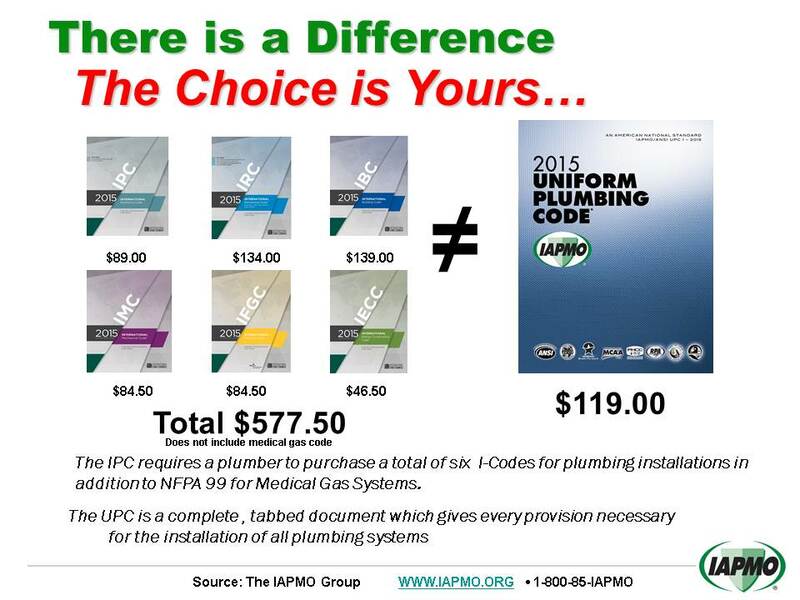 Click here to see the comparison between the UPC and the IPC costs. Written by and for the people who do the work: plumbers, mechanical engineers, contractors, elected officials and inspectors. IAPMO is proud to utilize an open consensus process accredited by the American National Standards Institute (ANSI) in its code development practice. At its annual education and business conference, members and non-members alike — can have a voice and a vote on proposed changes to the code. Final determination of code text is done through a governmental consensus process versus an open consensus process like IAPMO uses. Voting members are made up of “governmental member representatives and honorary members” (another word for bureaucrats). Notably, voting members do not appear to include the people who actually do the work. They are dominated by government building officers ad code enforcement officials. Single volume, tabbed book. Total cost $119. Six-volume code. Total cost $577. This is a prescriptive code that objectively describes in detail how work should and should not be done in a particular installation. You don’t have to hire an engineer to design later modifications because they can be built on what was done before. Want to understand more about prescriptive vs. performance? Click here. This is a performance-based code that describes the desired result of an installation. It doesn’t describe how to do—or not do—the work itself. This subjective approach leaves a lot of room for the installer, inspector and others to have their own interpretation of the right way to do the work. Want to understand more about performance vs. prescriptive? Click here. You can do work anywhere from Seattle to Walla Walla using the same code book. Every jurisdiction would have the option of requiring the UPC, the IPC, or in some cases, both.